This guide had been written in order to speed up the testing process. If you have any questions, please contact the County Court Bulk Centre (CCBC) who will assist you. You will have been provided with a Customer code, Claim & Warrant range. The Warrant (N323) range is allocated providing you with enough Warrant numbers for one year's issue. Centre (CPC) will obtain a TESTING username and password in order for you to log on to the server. This will be provided to you via email. Once you have the above you are then ready to format the data to submit the first TEST file. Limit the test to a maximum of 10 claims per file. Start files with 001 and increment by 1 as each new file is submitted. The result of the tests will either be a Pass, Fail or partial Pass on skeleton data. A partial fail is when the data has failed on validation (skeleton data). This means that the data formatting has been successful however the actual data is incorrect. For example � the defendant's name is missing or the claimant's name is missing. environment recognises that the sequence has run and will not allow the test to proceed. The TEST data should be compiled as if it was in the live environment. Judgment is entered against that claim. A Warrant is issued against the Judgment, and the same case is marked as paid. Remember that the data file must have the header and footer present. The data formatting for these can be found in the Code of Practice. Q. How long do we have to TEST? A. Test data is held on the CCBC system for one month from pass date. You will have to submit the next TEST file within this month in order for the data to be continuous. please contact the Centre and they will request that the data is held longer. Q. When will we be notified of a TEST result? within four days to tell you the result to your test. Q. 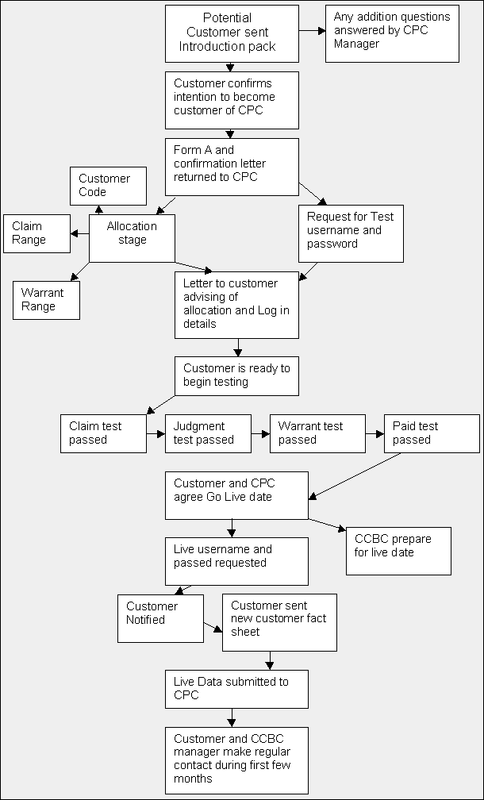 How long does it take to pass testing and become a LIVE customer? where possible in order for you to meet this. DX/post (if using the floppy disk). the post if sending the data by floppy disk. Hint - The Advice Note can be found in the Rules of Membership and the text should be in Arial 12. Hint - The data provided on the advice note should match that of the data files. Once you have passed testing, you will have to agree a go live date with the centre. Before going live you must advise the court of how you will be making payments for the issue fees. You can either be an arrears customer or deposit. into credit, the finance clerk will then use this and notify you when the funds are running low. giving details of who to contact within the bulk centre and procedural information.